Francis Ford Coppola’s first mainstream feature is a little gem of gothic horror, stylishly helmed on a shoestring budget. As an eccentric Irish family bickers over a vast inheritance in a lonely mansion, a mysterious axe murderer picks them off one by one. 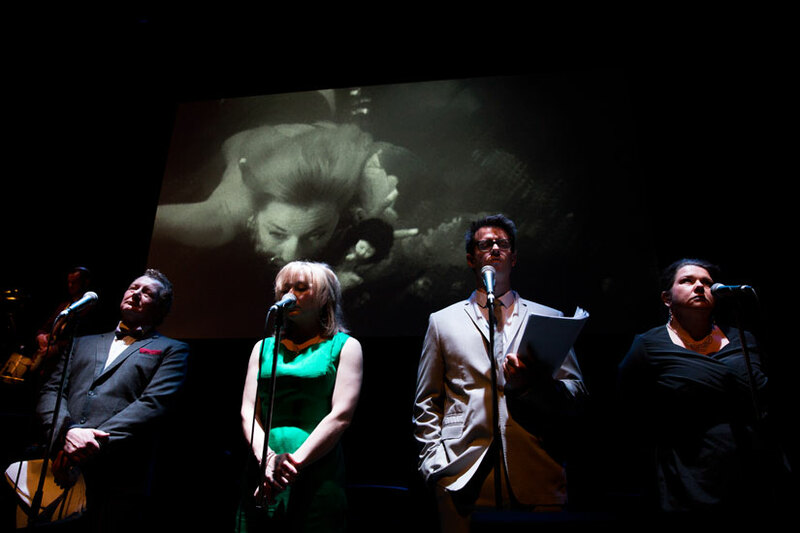 Live Live Cinema’s second production has been thrilling audiences in England, New Zealand and Australia since 2013. Live cinema offers a fascinating deconstruction of the film-maker’s art. The usually seamless synthesis of sound and image is disrupted as the film score is performed live, dialogue is spoken into microphones and sound effects are created before your eyes by a foley artist. The live performances create an ironic distancing, but what is surprising is that even as the elements of film are dissected and laid out like items on an operating table, the illusion reasserts itself and the audience is swept away by the power of the story. The method also breathes new life into neglected cult classics and the choice of Dementia 13 is a smart move. 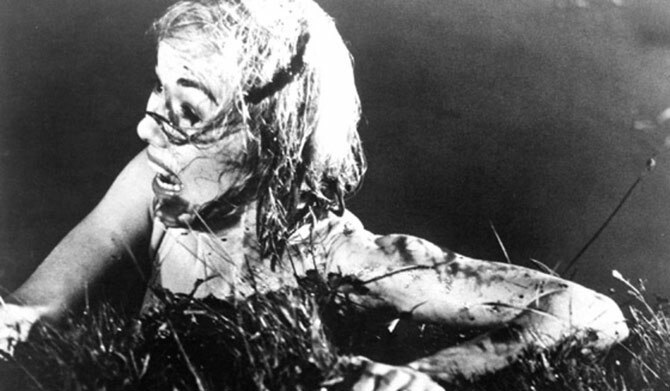 The 1963 horror flick has the kind of curiosity value that could fuel a bevy of film studies doctorates. It was Francis Ford Coppola’s first mainstream directorial effort, features a wonderfully unhinged performance by Patrick Magee and is a perfect example of Roger Corman’s genius in producing bottom-line knock-offs of film masterpieces. The hastily devised script consciously references the gothic atmosphere and weird Freudian psychology of Hitchcock’s Psycho. 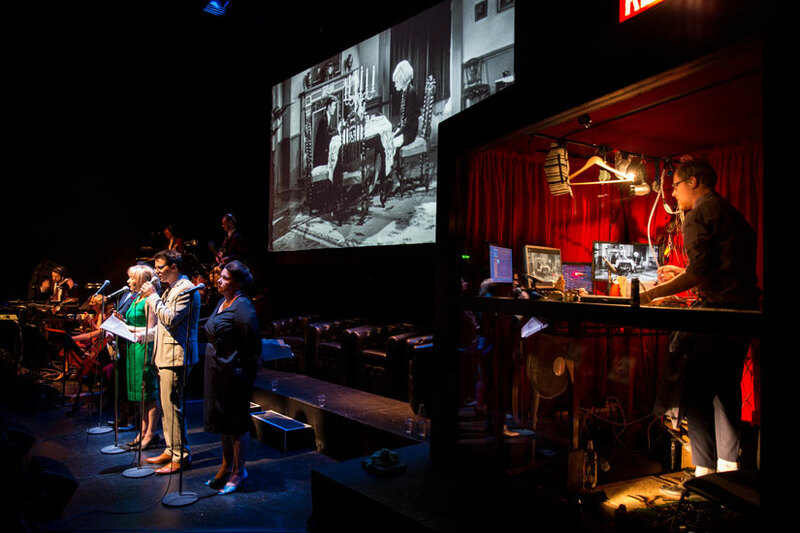 The live performance places extraordinary demands on the actors who are strangely disembodied from their on-screen doppelgangers, and the cast skilfully carry off the trick of lip-synching multiple characters. Fern Sutherland and Charlie McDermott appealingly capture the swirling emotions of a silver-screen romance, while Cameron Rhodes gleefully inhabits Patrick Magee’s deranged investigator and Bronwyn Bradley nails the extravagant histrionics of an Irish matriarch. 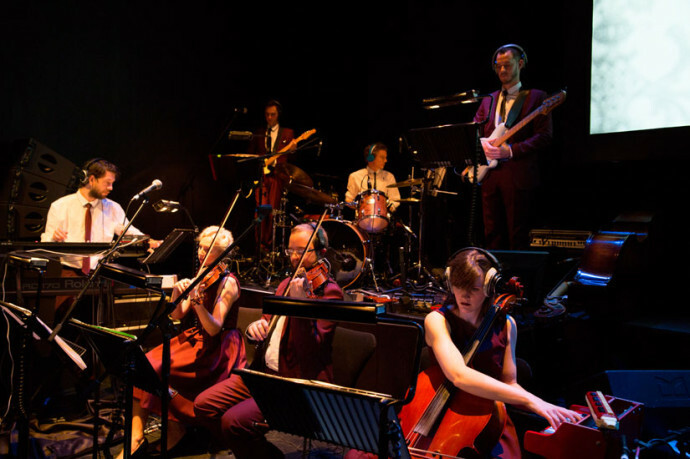 The centrepiece of the production is a soundtrack composed by Leon Radojkovic and performed by a remarkably versatile seven-piece band. Eerie string sounds and subtle mood pieces are woven into a driving rhythmical structure that boldly carries the rising suspense and explosive on-screen mayhem. Dementia 13 is not good. In fact, it’s very, very bad, featuring a flimsy plot, plodding pacing and laughably poor dialogue. 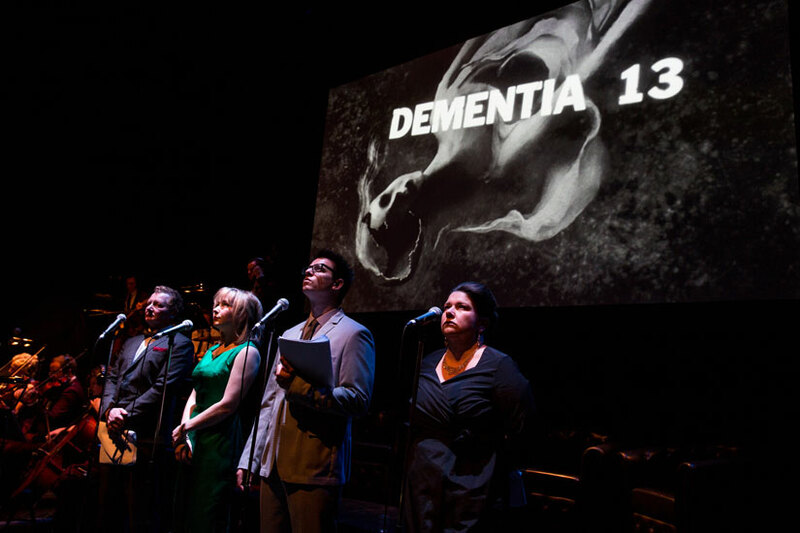 I suppose here I should clarify that I’m talking about Dementia 13, the little-known B-movie from 1963, and not Dementia 13, the theatrical reinvention of the same, now playing at the Herald Theatre. The former is terrible; the latter, marvelous. 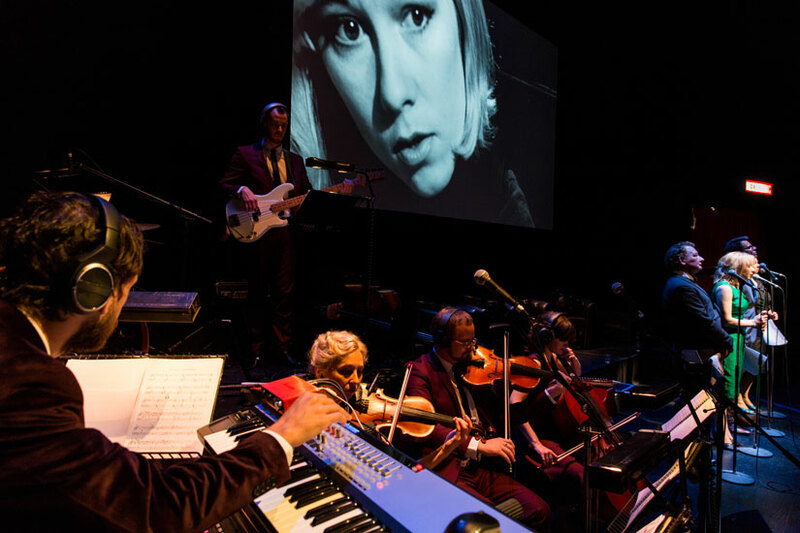 If you saw the 2011 Arts Festival performances of Carnival of Souls, the first collaboration between composer Leon Radojkovic and director Oliver Driver, you’ll know what to expect: above the stage, an early-60s horror movie silently spools; below and to the left, a seven-piece band performs a new, Radojkovic-composed soundtrack for the film; dead centre, four voice artists synch the dialogue with word-perfect precision; and to the right, sequestered in an illuminated booth, a foley artist recreates the sound effects’ every last crunch, squish and splat. It’s a brilliant idea, though with four different theatrical, musical and cinematic artforms working in tandem, there’s so much going on it can be hard to take it all in. Foley artist Gareth Van Niekerk, with his arsenal of tools and tricks (including, Monty Python fans take note, a pair of coconut half-shells to imitate the clip-clop of horses’ hooves) is especially fascinating – a fact that the production plays with in an overtly meta moment halfway through, featuring some lost script pages and a comically large butcher’s knife. Before undergoing the Live Live Cinema treatment, Dementia 13 was mostly notable as the first mainstream directing credit for Francis Ford Coppola, back when he was plain old Francis Coppola. Other than a few interesting camera effects, the film shows little of the genius that was to win him a Best Director Oscar for The Godfather less than 10 years later. In fact, it’s a markedly worse film than the strange and atmospheric Carnival of Souls – also making a brief Live Live Cinema return this weekend – and thus even funnier. Playing multiple members of the gothically depressed Haloran family, voice actors Fern Sutherland, Bronwyn Bradley, Cameron Rhodes and Charlie McDermott are clearly having a ball. All are hilarious – Sutherland’s tiny grunts and sighs during moments of exertion are a particular delight – but it’s Bradley’s Lady Haloran, all strangulated vowels and overwrought shrieks, and Rhodes, as the scenery-chewing family doctor, who get the biggest laughs. 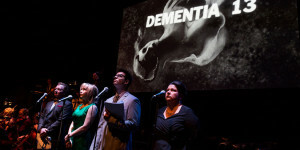 Since its 2011 Civic Theatre debut, Carnival of Souls, the live experience, has played at theatres in New Zealand, Australia and Germany; at the close of this short Auckland season, the team travel to the Barbican in London for productions of both Carnival of Souls and Dementia 13. Catch them while you can. I ain’t no thespian. Or at least, I’m not much of a theatregoer. I like movies, and even then I only like movies because Leo DiCaprio or because Batman or because Sandra Bullock rolling around in space. My critical eye comes up a little short-sighted. Consequently I’d never asked myself whether cinema and theatre could merge. It wasn’t a question that had cropped up as I googled Jennifer Lawrence gifs or Tina Fey quotes. So needless to say that as I made my pea-brained way down to the Herald Theatre to see Live Live Cinema – the place where the stage meets the screen – I struggled to conceive what I was in for. The mediums wouldn’t match in my mind. I say ‘pea-brained way’ because I equally couldn’t conceive where the Herald Theatre was. Turns out it’s behind the Aotea Centre – and thus my first learning experience was complete. It’s a wee gem of a space and they sell Kettle Corn at the snack counter, mega-bonus. Tucked in my seat I immediately fell for the overwhelming handsomeness of the live band. The fellows & ladies who would be piecing together the film’s score donned 60s style burgundy suits & dresses that made my heart melt a little. As did the miniature piano that would be an integral part of Dementia 13’s doll-creepiness. Turns out it’s not that adorable. Just terrifying. 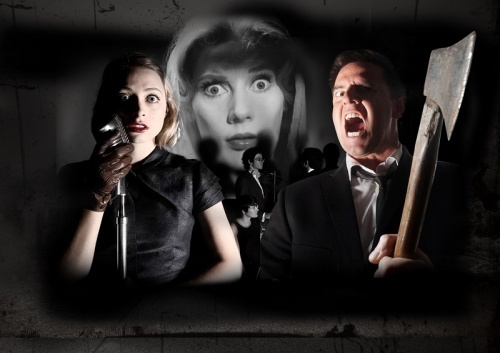 I hadn’t watched Francis Ford Coppola’s horror before, not that it would have made a difference if I had – with the cast, foley artist and band onstage it was a whole new take on the idea of a fright fest. As the film rolled silently behind them, the actors with nothing but microphones as props did an amazing job with accents, perfectly timed light comedy and managing to stay in sync. Meanwhile for every frightening bizarre twist and turn, we had mad sounds from that wizard mini-orchestra-burgundy-band. Classic horror string sections and a sixties band vibe put the soundtrack at the forefront of the film as you watch – an awesome novelty. And as if that wasn’t enough to give your ears and eyeballs one heck of a workout, to the right of the actors sits the foley booth plus one foley artist. Like an eccentric inventor, he blows bubbles, makes footsteps creak and jangles keys like he’s dancing a perfect tango. Not one clank, plink or splash beat missed. Impossibly, the tight-knit team manage to keep you simultaneously within the film and on the stage with them. Rather than one element of the 4D experience detracting from the other, everything is expertly heightened. A sensory overload like no other. Go and see it, is what I’m saying. Make the most of something a little out of the ordinary. Full disclosure first of all: I am a cinema purist. To the point of snobbery. 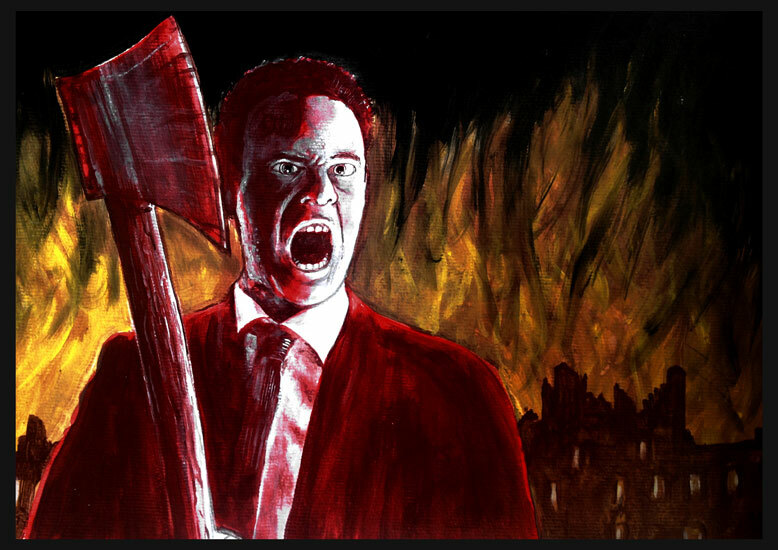 If you talk or text during a movie, I will ask you to stop. Continue to do so and I will probably cut you. I’m no fan of comedians who think they are funny by riffing on films with snide remarks during a screening or consider themselves better than something of questionable quality made before they were born. Put simply, I treat movies with the respect they deserve. Call me old fashioned. And it is quite the old fashioned aesthetic and respect that informs Leon Radojkovic’s re-scoring of Francis Coppola’s first feature from 1963, Dementia 13. 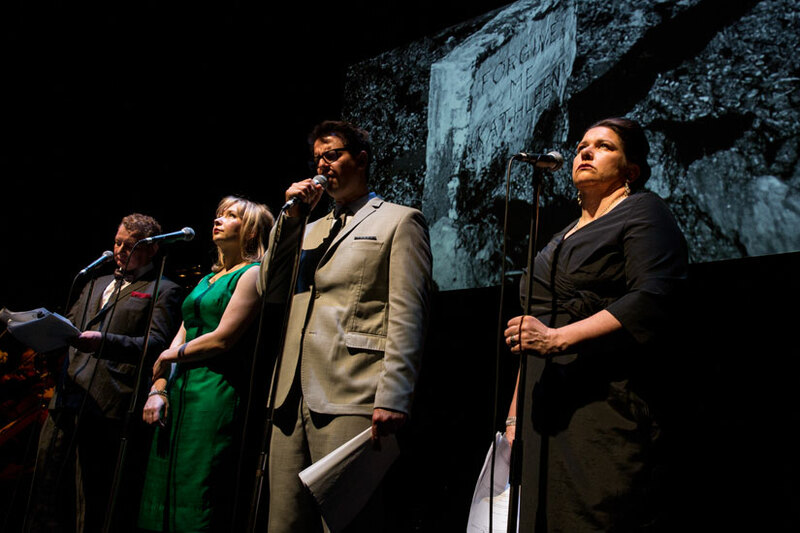 This is a performance to appeal to those of us who recall both cinema and radio in its heyday of presentation in the twentieth century. 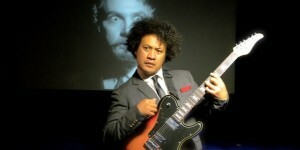 Radojikivic is known around Auckland as a musician of considerable talent and knowledge, who isn’t afraid of being playful with his source while still honouring its core – his band, Dr Colossus, covers many film scores in unusual ways, most notably Danny Elfman covers using various weird and unexpected instruments. He has excellent presence in his musicianship and finds a wonderful depth in all of his composition. 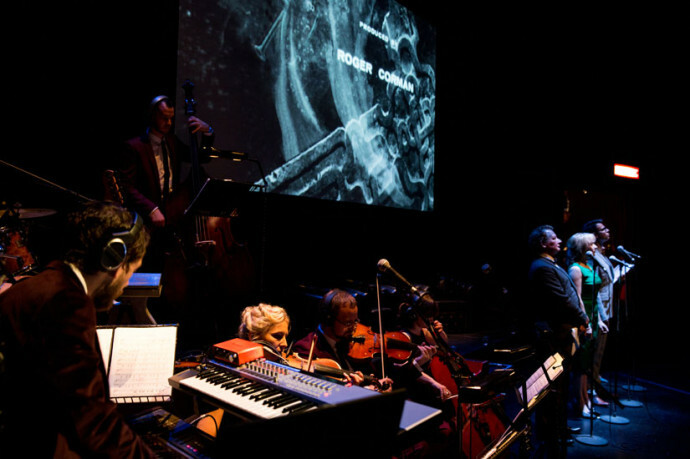 His original re-scoring of Herk Harvey’s cult classic Carnival of Souls at the Auckland Arts Festival a couple of years ago got audiences quite excited with its clever jump-scares and sophisticated, playful attitude. This time around Leon and his small band treat Coppola’s original film with the same sort of vibrant, driving, bass-heavy amplified soundscapes to similar effect. To cult movie fans, Dementia 13 is known as a rather clumsy early film from a now widely regarded Hollywood heavyweight. It is full of melodramatic, half-baked performances and a slightly flat oddball script. This new score helps improve things immensely by dispensing with the thin reedy and brassy orchestration of the original and giving us screaming violins, deep wild guitars and a touch of the Celtic, on which the tensions of this dark nasty wee thriller are played out. The similarities between the scoring of this and Souls is pretty clear and illustrates this composer’s soft spot for the theatrical moments at the core of these 1960s American gothics. The strange, juxtaposed visuals lend themselves so well to the propulsive, explosive punctuation thatRadojkovic seems to enjoy playing with so much. This production, however, is not only about the film and the music. Director Oliver Driver neatly blends the theatrical into it all by placing actors at microphones to re-voice the roles and a Foley artist in a booth at side of stage to re-imagine the soundtrack of the environments and movements within the film. Gareth van Niekerk has his work cut out for him in that tiny red curtained studio upstage left, as he busily creates each and every nuanced near-undetected sound to an exacting degree. So much so that when something doesn’t quite work, we notice: especially the rather poor ‘click’ of a gun when it is supposed to be firing live rounds, or the difference of slippered feet on carpet that sound like patent leather shoes on wood. A small quibble, but this could have added just the tiniest extra ounce of verisimilitude to keep us fully engrossed. 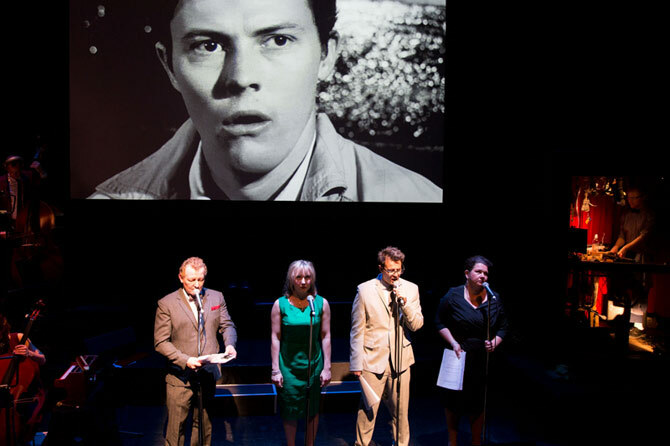 The four actors at microphones – Fern Sutherland, Cameron Rhodes, Charlie McDermott, Bronwyn Bradley – all acquit themselves well and lift the characters away from the slightly wooden, starchy delivery that is so lamentable when watching the film as originally performed. There is the odd wobbly accent, but that can be more attributed to the number of characters each has to keep distinct than with anything to do with the actual delivery. There’s a nice neat but subtle touch having McDermott play both of the rather similar leading men who end up in an axe fight against each other at the end. 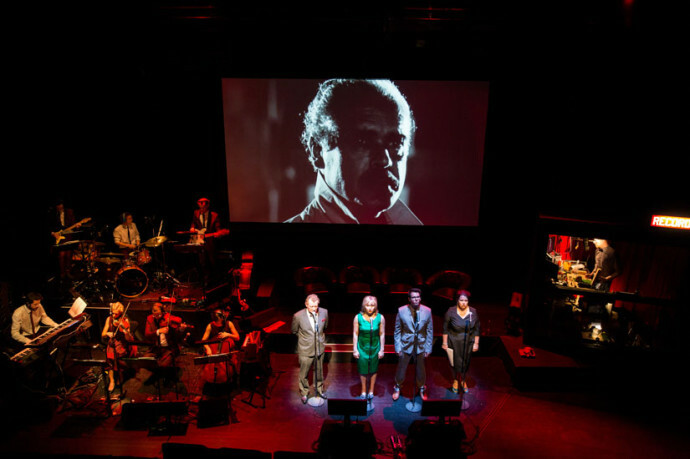 Unlike Carnival of Souls though (which is being reprised here at the Herald, Friday 11 and Saturday 12, 6.30pm), there is no real attempt at any sort of framing device for the theatricality; the actors and musicians just gather, get ready and do their thing once the film starts rolling. There is one moment mid film where the actors strongly react to the on-screen action, but that seems to be a comment on the lack of direction the plot is taking rather than pulling further levels of meaning out of the film or surroundings. I’m not sure what could be added, but I would have liked to have been a little more drawn into the inner lives of the actors playing with and relating to the action up on screen. That complaint may be more to do with the current space than any of the actual direction though, as The Herald Theatre’s steeply raked seating means sightlines train our eyes towards the film rather than down to them very much. And that’s my other main problem with this production: the space. 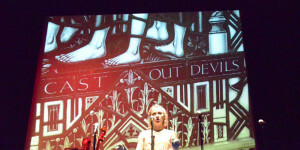 The production of Carnival of Souls in the old Mercury Theatre was bequeathed an excellent charming history by its surroundings that contributed to the specialness of the event. Here, it doesn’t detract, but I would certainly have liked to have felt a bit more of that terrific retro mustiness that these kinds of films were viewed in during their heyday. The lighting is all functional to helping the band see what they’re playing, the actors and Foley artist in light to keep them a focus for us if we want to watch them, with enough evocative bleeding of reds and blues to keep a bit of mood and not detract or spill onto the screen. The blinder lights during the more nerve-jangling moments could be dispensed with completely though, as the startling musical accompaniment really does carry on-screen events much better on its own. However, for all of my little film-snobby purist niggles, I really do appreciate the hard work that has clearly gone in here from Radjokivic and his pals. This is a nice fresh coat of paint for a slightly creaky cinematic oddity that becomes a unique, thrilling and worthwhile evening’s entertainment.